When Islands of Adventure opened in 1999, it was the equal to any Disney Park in the world. It was technologically advanced, it's themeing was unsurpassed, and almost every attraction emptied out into a gift shop. Attractions like Spiderman and Poseidon's Fury are techno wonders. Hulk is one of the best coasters in the world. Seuss Landing brought the world of Dr. Seuss to life for the first time. Jurassic Park allowed you to explore the world of dinosaurs without getting eaten by an attraction. Toon Lagoon brought all your Sunday Comic Strips to life. But, something happened. Or rather, Nothing Happened. In the intervening 10 years, there have been no significant changes to the park. Not until 2010, when Harry Potterland opened, had there have been any changes to the park that someone who was here in 1999 would recognize. Further, the park isn't being kept up as well as it should be. The colorful, whimsical buildings in Seussland have faded, and needs a paint job. Main Street Persia (i.e. Port of Entry), which was once a themed marvel, is now just a walk to get to the park itself. To be fair, Islands of Adventure is the Disneyland of the East. It was built on the available land that Universal had, and it does make good use of the space. But looking at the park now, the lagoon is rarely used for anything, and is just so much wasted space. It could have been made smaller to expand the park. 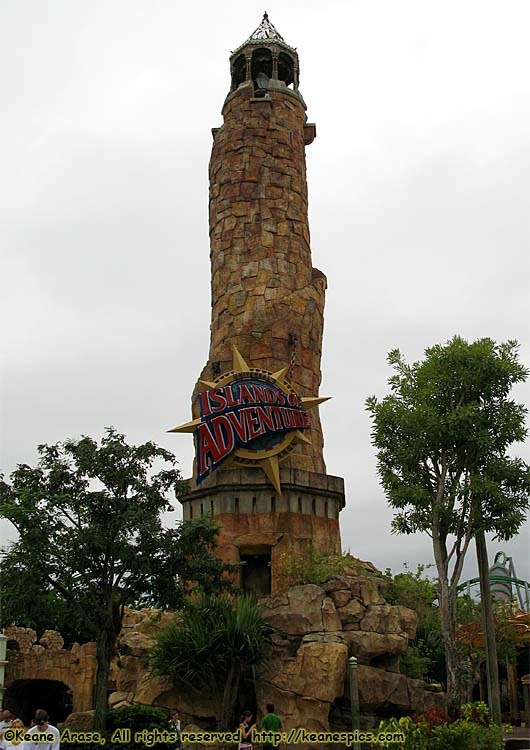 Islands of Adventure's icon is a Lighthouse of Alexandria replica, which tower 130 feet above the Port Of Entry. The Port of Entry is a brilliantly themed marketing area, and the entrance to Islands of Adventure. Marvel Super Hero Island is a place right out the comics. Geometric, generic, colorful. Two of the signature attractions of IoA are here, and arguably two of the best attractions in the Orlando area, Spiderman and Hulk. Both of which, are Disney char... Oh, never mind. I can attest that Spiderman is a techno-wonder, and for years I considered it the premier attraction in the Orlando area. But years in the theme park biz is a long time, and I think the new Star Tours matches the experience. While Star Tours doesn't have the ability to literally change sets and spin 360 degrees, it's motion and ability to seamlessly change the story (but not the story line) is impressive. And man, it's Star Wars! But I digress. Since I am a certified coaster chicken, and have the Woody Woodpecker keychain to prove it, I can only take testimony from people I know who've ridden it and declared it one of the best coasters, ever. And in designing the coaster, they made it roar. Instead of filling the support structure, they left them empty, and they literally roar when the coaster screams down the track. Now, for Marvel Super Hero Island, this is good. Hulk does roar. Hulk should roar. But the problem is, Hulk roars in Seuss Landing. Hulk roars in Toon Lagoon. Hulk even roars in parts of Jurassic Park. It is stepping on the theme of the other islands. Okay, if one of the islands sunk like Atlantis, it could be Toon Lagoon, and I'm not sure I'd miss it. While the thought of themeing an entire area after the Sunday comics is a pretty good idea, I think some things become apparent after it's done. One, the Sunday comics changes every Sunday. Toon Lagoon... Didn't. And two, after you read them, you throw them away. I'm not exactly sure who this area is for, either. Snuffy Smith? Betty Boop? Do kids today even know who they are? The other problem, is both key attractions here are water rides, pretty unappealing when it's December and 50 degrees, which essentially makes it a walk through to Jurassic Park. That said, I really like Bluto's Bilge-Rat Barges over Kali, I think it is, a better overall ride. Maybe not as themed as well as Kali, but the whole point of raft rides like this is to get wet. Once you pass under that arch and into Jurassic Park, you are in Jurassic Park. They've done a very good job of themeing this area, isolating a lot of it from the rest of the park. 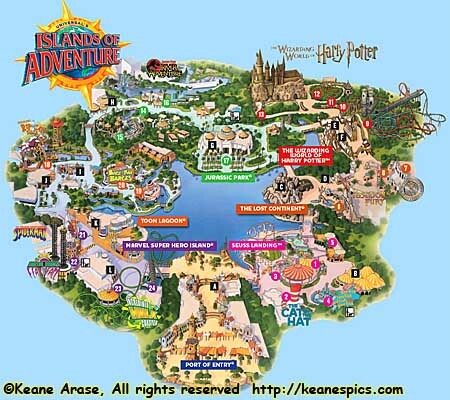 The Lost Continent is really the only "island" in IoA that came from the imagination of the developers. All the other islands are based on some sort of setting already in media. Much of this area was sacrificed for Harry Potter, where both the Unicorn and Dueling Dragons coasters being usurped by the new land. Virtually everything beyond the Sinbad theater is gone. Sinbad, a live stage show is still here. It's got humor and action, and isn't that bad of a show. The premier attraction in Lost Continent now, is Poseidon's Fury, a walk-through special effects show. It's pretty impressive, from water screen technology to a water tunnel that you have to see to believe. Recommended. I haven't visited Potter yet, since I have no desire to deal with the crowds until they die down. However, one must comment on the changes made to Dragon Challenge (nee Dueling Dragons.) This coaster used to be a unique dual coaster, which would actually weigh the trains, then launch them so the trains meet in several places, with guests passing within 18" of each other. Well, guests were asked to secure items, and Universal even provided lockers, but repeatedly stupid people refused to store their things. This resulted in cell phones and other objects being thrown from the particularly rough coaster, sometimes causing severe injury to another passenger in the other, dueling vehicle. So this coaster neither duels, nor challenges any longer. It may as well be two separate coasters now. All because of stupid people. sigh. When IoA first opened, Seuss Landing was brilliant. Bright colors, whimsical, no straight lines. Even the trees were bent. It truly brought the world of Dr. Seuss to life. It was also one of the reasons I decided to take a hiatus from Universal. By 2008, 10 years after opening, the place looked terrible. The paint faded, and the lack of maintenance was appalling. Overall, I like Islands of Adventure, though I do think there's a lot of wasted space in the Lagoon, as well as the lack of an overall theme to the park. It is also heavy on water rides, which won't draw many guests during the colder months of the year. The park never did gain the dominance Universal was hoping for, still falling behind Walt Disney World's least visited park. Even with Potter increasing attendance by 30%, IoA still falls to Disney's Hollywood Studios by close to 2 million visitors per year.